Birthday parties? Yeah, we got them! Two a year, and so far I’ve thrown six themed birthday parties for my kids. I end up loving each one more than the last. It’s so exciting to research ideas, and create DIY projects to go along with each boy’s special day! For our youngest’s second birthday, we threw this DIY Puppy Dog Birthday Party! He’s loved puppies since he turned one (although now that he’s a big boy, he’s branching out into dinosaurs! ), so we filled his day with puppy love at a Puppy Dog birthday party! We like to make our kids’ birthday’s special by taking them out to breakfast on their big day, and then going on a special trip. Sometimes big trips, and sometimes short. This year we kept it short with breakfast at our favorite: First & Last Bakery in Hartford, then a visit to the LEGO store to pick out a small Duplo set (Superman. Of course!). The next evening, we threw the big family birthday party for our little guy! Puppy Dog Birthday Party Invitations & Outfits! I started out with hand-crafted Puppy Dog birthday invitations using scrapbooking punches and cardstock! I had so much fun making each invite feature a unique puppy! I’ve had a piece of dog-print fabric in my stash for almost two years now, and this fabric actually became the inspiration for the party and color scheme. For the boys, I made coordinating t-shirts with ironed-on puppies. I ironed a sheet of Steam-A-Seam onto the back of a section of fabric and cut out dogs, balls and stars. These were easy to iron onto the shirts for each boy. My only regret is the craft store didn’t have ANY 2T or 3T blank shirts, so my two year old is wearing a 4T shirt that is a bit large! I also made the birthday boy a bib with puppies on the outside and blue minky on the inside, plus a lining of PUL fabric between. It was perfect, maybe even better than the t-shirt! Having thrown so many parties, I have learned less can be more (when it’s crunch time, you don’t want to have your husband in the basement still blowing up complete Pinterest-Fail balloon topiaries. Not that I know anybody who would make their hubby do that or anything!). So I really tried hard to keep this party simple – not counting the balloon topiaries. Oh and the pretzel dog bones. Yeah…. moving on! I chose a red, white, and brown color palette, and decorated with red and blue balloons, including 36″ balloons I tied to a paper serving bowl to create hot air balloons full of Beanie Babies puppies! With the help of craft supplies sent for review from Oriental Trading, I create several simple decorations. For a simple garland, I punched out various sized circles from chevron red, white, and blue scrapbooking paper, as well as scalloped rounds from brown kraft paper. Then I zipped them through my sewing machine with red thread to create a paper circle garland. So super easy and I will definitely create this garland style again. As my sewing machine kept snapping the thread, I ended up with many sections of garland, so I laid them on the serving table at intervals to create a “striped” effect. I also dangled some from our gazebo chandelier! For menu signs, I wrote on chalkboard paper to create each hot dog creation “recipe,” then mounted the sticky-backed chalkboard paper to the kraft paper with a tongue depressor between the layers to create a sign. I stuck the signs in simple ceramic milk bottles with baker’s twine tied about the neck for easy sign holders! Being a puppy party, we had to serve “dogs” – hot dogs! We’re not a big hot dog eating family, but I found Coleman’s organic hot dogs and they were tasty. I scoured Pinterest for the best “hot dog recipes” to create our hot dog bar, and posted signs with suggested recipes. Obedience School (like Simon Says but with Puppy commands like Fetch, Bark, Chase Tail, etc). Instead of birthday cake, we served Pupcakes! Our little son is obsessed with cupcakes! These pupcakes were very easy to make – frosting, Nutter Butters, Nilla Wafers, candy eyes (such a time saver and very inexpensive in any craft store’s cake section!) and a fine tip for detailing. After eating and eating and… eating… and being a little scared of the candle on his birthday Pupcake, we brought out our son’s BIG present: our family had gotten together to give him a Radio Flyer Red Wagon! His big brother pulled the wagon around the corner to surprise him… at the same time that a plane flew overhead, so it was a bit anti-climactic. About a half hour later though, I about had a heart attack seeing him hanging onto the wagon for dear life with an exhilarated expression on his face while his brother pulled him along at break-neck speed! Yikes! We’re gonna love that wagon! Oh and! Our baby praying mantises from the garden are growing up and exploring. One came to visit the party, and our little boy was just delighted to have a green friend crawling on his arm for awhile! I think he’s loving bugs a bit more than puppies lately! Hope you enjoyed a peek into our party! I’ll be sharing birthday present ideas with you later this week! A good time was had by all, and another themed birthday party goes into the books! Thanks to Oriental Trading for providing supplies to facilitate this post. All opinions are my own. Hi …i love the ideas… i was wondering if you had a recipe for the pretzel bark or if you just bought it somewhere? This is so cute! I love that it could totally be either a boy or girl party. My daughter loves puppies and this has given me a ton of ideas! I love the idea of puppy chow as a treat. I love puppy chow! Thanks for sharing! I love the hot dog trays and puppy cookie treats. This looks to be an easy, inexpensive party. 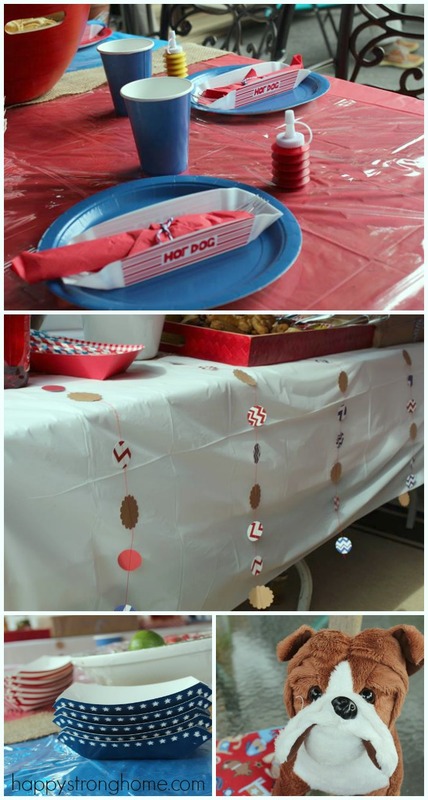 This party idea is so creative. It would be a hit with my kids and party guests. What an adorable idea! I especially love the little doggies with nutter butter ears! Love it! I love this idea for a birthday party. The hot dog bar is a great idea and the pretzel dog bones are too adorable. I love that so many of the decorations can be made at home without the need to purchase which would save a lot of time and money for me. wow!!!! Now thats an awesome party! looks like a feast to me ! You have such great ideals ! Thank you for sharing these! What a great party theme and very creative accessories. I love the chalkboard paper and the puppy dog cookies are amazing! totally cute and creative. i love the food ideas and the decorations . how fun! Oh my goodness, this party turned out so adorable. The food looks delicious!!! WOW that was a super party! I love how creative you are! A Puppy Birthday Party sounds like so much fun especially with all the great ideas you gave me (puppy kisses, puppy pretzels, pupcakes – your little boy was afraid of the candle, his expression shows it). I recently discovered Oriental Trading and love it plus their low prices. So cute. Love the hot dogs and the puppy dog cupcakes. You did an excellent job. I love the party games idea like Simon Says with dog commands. So cute. I also liked the signs for making creative hot dogs. We usually do hot dogs for birthdays but with ketchup and mustard. We do serve baked beans though. You did such a nice job on everything! Love your dessert table best of all – especially the adorable Pupcakes! Let me start out by saying your boys are adorable! This whole party is so cute, from the decorations to the presentation of the food. Oh, and those cupcakes…Love them! Looks like a fun, fun party! What an adorable party! My favorite is the puppy cupcakes! Oh my goodness! What a great birthday theme. You did some really fun and creative things for the party. LOVE the puppy cupcakes. I’m sure the kids enjoyed this birthday party. Adorable! I love the pretzel dog bones and the garland especially. And I’m really curious about the watermelon salad? I don’t see it in the pics and I’m wondering what else it contains? You always come up with awesome party themes! Even the naming of the foods is unique! Looks like they both had loads of fun! What an awesome party! I would have never thought of a puppy party but it’s such a cool idea. I’m loving the homemade bib and the treats are exceptionally cute. Good job mommy! so cute!! I love that you made puppy chow!! You are just totally creative. I love the pretzels shaped like dog bones. oh my goodness what a super fun party, love the theme! The puppy treats are the cutest thing ever! That is sooooooooooo cute!!! I wish now I had a little boy so I could use this idea. What a stinking cute party! Plus cute kiddos! I love all the great ideas, the hot dog bar is genius. What a cute party. Another fun game could be a Dog Bone relay race using Milkbone type dog treats and dog bowls. Looks like you had a great time! Looks awesome! This is a great idea. That hot dog bar look delicious! Also, your kids look adorable and I bet they had a fun time! Okay, this is the cutest birthday party idea ever! What a cute birthday boy as well! I’ll have to throw my son a puppy dog party for his second birthday; we love dogs at our house! This is so fun. I love the menu and decorations. The bone shaped pretzels sound delicious! What adorable kids, and an even cute party! I love the little doggie cupcakes. What a FUN party theme! Those cupcakes are adorably delicious looking! Wow! What a total Pin-worthy party! I love the details and all the love you put into your kids’ birthdays! Wow! How impressive. This is one of the nicest parties I have ever seen on line. I shared with so many haha. Want to come put on my next one? I loved all your different topping and the nutter butter cupcakes are so cute!. For starters, those are the cutest boys I have ever seen! ADORB as my daughter would say. I absolutely love evertthing you did for the dessert table! The puppies are too cute! You are soooo talented! That is such a cute theme for a birthday party! I really like the hot dog bar idea. Kids love hot dogs, and I like that there are enough toppings there that the adults will enjoy it too! What a fun idea for a party. I just love all the details! What a fun party idea. My sister in law did a puppy themed party last year and the kids loved it. This is such a cute theme for a birthday party. I wish I had done something like that when my son was young. This is absolutely adorable. The pretzel bones are perfect! Such a cute party! I love the Obedience school game, that is adorable. Seriously such an adorable party with some great ideas. I love that hot dog bar! Awe, I love all the details, so adorable!! My twins had a puppy birthday for their 2nd, and I would have loved all these great ideas! Passing along to a friend, she’s planning one currently! That is such an adorable puppy birthday party! Seriously so cute! I love the hot dog trays, and the puppy cupcakes! So stinking cute! That is so adorable! I’ll have to do something like this for my daughter’s birthday. She’d love the puppy cupcakes! So cute. What great ideas. I am pinning those puppy cupcakes! That is such a neat idea for a birthday party! My boys joint party is this weekend, but our theme is Pokemon. What a super cute theme for a birthday party! I love the puppy cupcakes. Wow – you went all out! I love the trendy theme and how adorable everything is. I like the boy’s shirts. Those cupcakes are awesome too!